This is the seventh post in the series Framing the Guilty, Framing the Innocent. For ease of navigation among the posts, use the Table of Contents. In the case of Robert Otis Coulson, the Houston police planted an envelope on a desk. 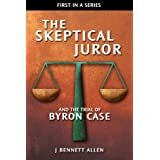 The State and People of Texas used that planted evidence to convince a jury that Coulson was expected to be at the murder scene around the time of the murder. In the case of Larry Swearingen, the police or the person who killed Melissa Trotter planted scraps of paper near the home of Swearingen's parents. The State and People of Texas used that planted evidence to convince a jury that Swearingen had been with Melissa Trotter on the day of the murder. Also in the case of Larry Swearingen, the police or the person who killed Melissa Trotter planted in Swearingen's mobile home a pair of pantyhose minus the leg that had been used to strangle Melissa Trotter. The State and People of Texas used that planted evidence to convince the jury that Larry Swearingen had strangled Melissa Trotter. 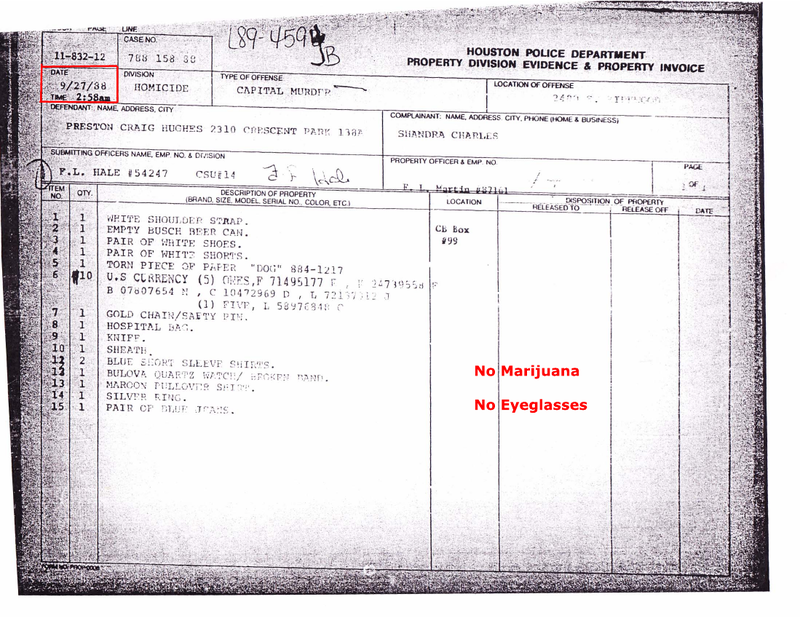 In the case of Preston Hughes, the most thoroughly framed man ever, the Houston police planted a pair of eyeglasses between two sofa cushions. The prosecution then used those planted eyeglasses to convince the jury that murder victim Shandra Charles had been in Hughes' apartment on the night of her murder. I'll begin by recreating the HPD search of Preston Hughes' apartment. I'll rely on the police report of HPD Crime Scene Officer F. L. Hale. Officer Hale's job was to photograph and collect the evidence. In his police report, he frequently referred to himself in the third Person. 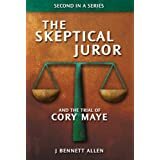 The Skeptical Juror believes that writing style confuses rather than clarifies, but The Skeptical Juror had no say in the matter. Officer Hale left the morgue and went to the CSU office. While completing the report I received a telephone call at approximately 8;30. I was advised by homcide detectives D.A. Ferguson and E.T. Yanchak that they had obtained a Consent to Search from the suspect. Officer Hale was requested to met with then at 2310 Crescent Park, which is the Lakehurst Apartments. Upon entering the apartment Officer Hale was lead into the living room and shown a pair of precription silver rim glasses. These glasses were found between the cushions of a three cushion couch, against the south wall of the living room. As Hale entered the apartment, one of the detectives led him directly to a "three cushion couch" in the living room and pointed to a pair of eyeglasses wedged between two of the cushions. 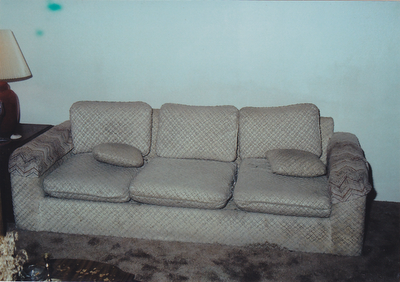 Officer Hale took two photographs of the couch and the embedded eyeglasses. I present the first of those two photographs below. Good luck seeing the eyeglasses. Maybe you can see the eyeglasses if you look hard, if you squint. There they are between the center seat cushion and the one beside it, the one rightmost in the image. Here's the second shot, presumably one that Officer Hale would consider to be a closeup. Perhaps you can see the glasses if you enlarge the image by clicking on it. To simplify matters, I've cropped the photo around the glasses, enlarged the cropped segment, and rotated it. Now you can finally see the glasses. 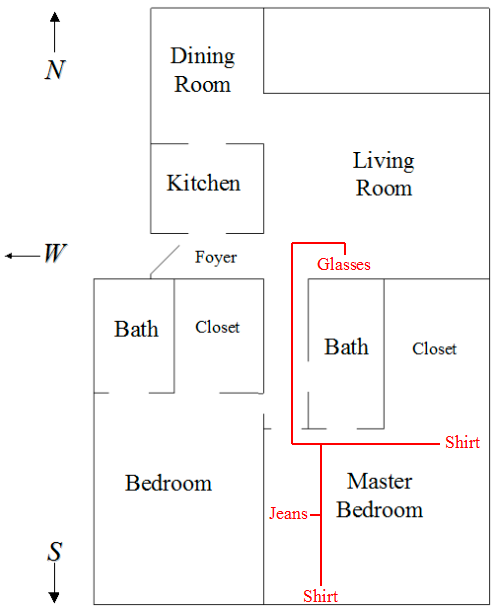 During Hughes' trial, Shandra Charles' best friend testified that she last saw Shandra alive, not long before the murders, wearing those eyeglasses while standing outside Preston Hughes' apartment. That testimony coupled with those eyeglasses were damning evidence of Hughes' guilt. Both the testimony and the eyeglasses were, however, manufactured evidence. 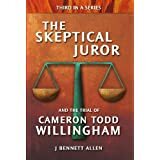 The friend's trial testimony is contradicted in all crucial details by the interview she provided to the HPD on the morning after the murders. The eyeglasses were placed in the position shown by members of the Houston Police Department. As I prove that to you, I will refer to the eyeglasses as the HPD glasses. The HPD glasses do not appear to me as if they simply fell into the position shown in the photograph. The glasses did not simply lay on a cushion, nor did they simply fall between the cushions. They appear to be forcefully wedged between two cushions. I therefore decided to see if my cheap, well-used reading glasses would fall between the cushions of my not-so-cheap but well-used couch in similar fashion. I dropped my glasses time after time. I dropped them while standing in front of the couch, while sitting on one cushion, while simultaneously pushing on the other cushion, while in the act of standing up or sitting down. As Dr. Seuss might say, I dropped them from a box, I dropped them with a fox. 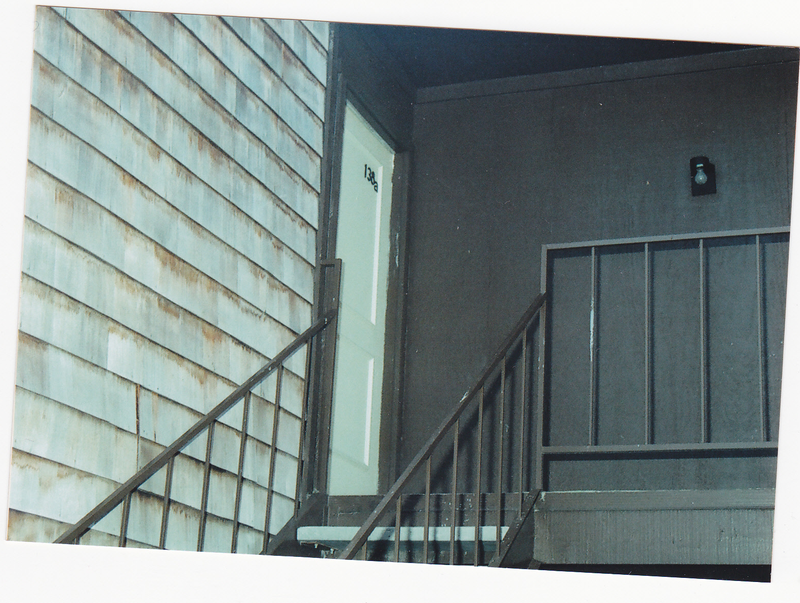 I was never able to approximate the arrangement recorded in Officer Hale's photographs. Though each time I attempted to drop my glasses in the seam between my sofa cushions, they usually didn't land in the seam. 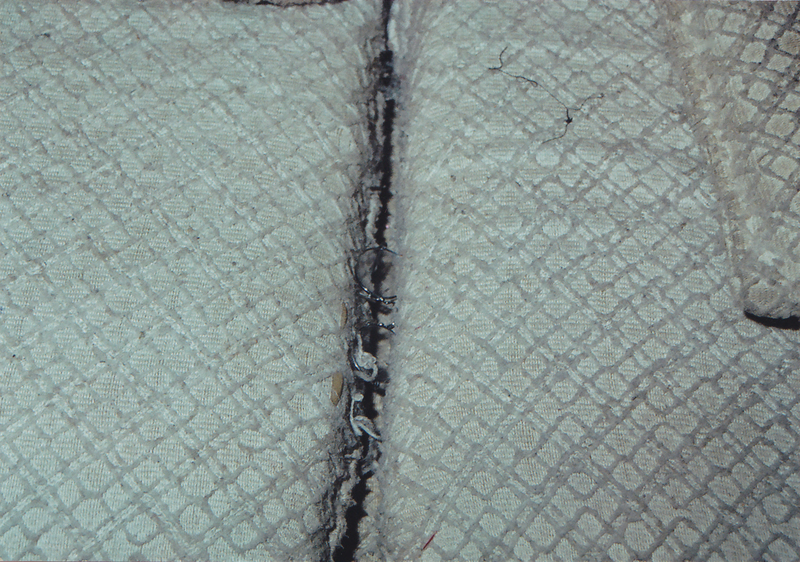 Most frequently, they straddled the seam. They did, however, fall in the seam with sufficient frequency that I have no difficulty believing eyeglasses can fall between couch cushions if dropped or placed nearby. 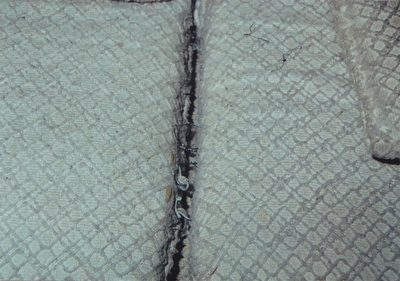 Here is a picture of one instance in which my glasses fell into the seam between the cushions. When my glasses actually landed between the cushions, they usually (almost always) ended up with the lenses nearly vertical. This is different than the arrangement of the HPD glasses. The HPD glasses ended up with the lenses nearly horizontal. Sometimes (not very often) my glasses ended up with the lenses horizontal, just as the HPD glasses allegedly had. While my glasses would sometimes land with lenses horizontal, they always ended up along the top of the seam between the cushions. They never managed to wedge themselves in between the cushions, as the HPD glasses allegedly had. I never really expected that they would wedge themselves in. They're eyeglasses, for gosh sakes, not anvils. I did wonder, though, if they might wedge their way in between the cushions if people sat on one or both of the cushions. So I tried repeatedly to cause them to wedge into a position similar to the HPD glasses. I arranged the glasses in many different starting positions, then I pressed on one cushion, then the other, then both. I even sat and wiggled around. No luck. No matter what I tried, I could not give my glasses a couch cushion wedgie. I came close a couple times. Consider the following image. Though it's somewhat difficult to see, the glasses are sorta, kinda wedged between the sides of the two cushions. It's not quite like the arrangement of the HPD glasses, but it's as close as I could get. 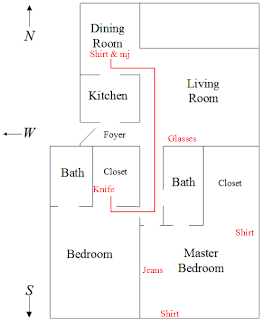 Continuing with Officer Hale's photographic stroll through Preston Hughes' apartment, I return to Hale's police statement and to my informative series of sketches. The egregious textual errors are in Hale's original. 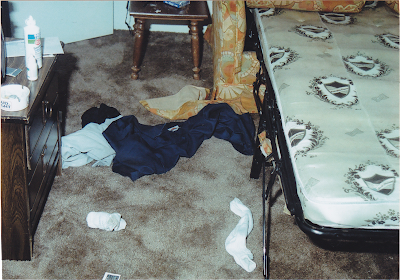 Officer Hale was then lead into the southeast bedroom and shown a pair of blue jean, two blue shirt on the bedroom floor. 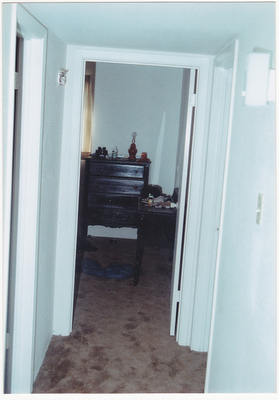 Here is the photograph that Officer Hale took looking down the hallway into the master bedroom. You can barely see a pair of pants and a shirt on the floor in front of a dresser. 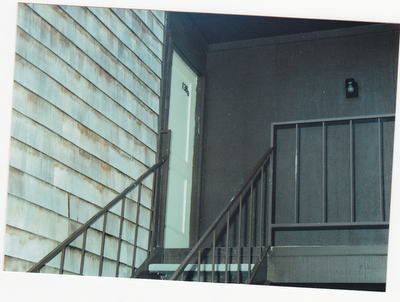 Stepping into the master bedroom and turning to his left, Officer Hale took the following photograph. 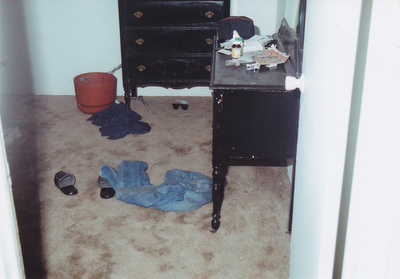 Together, the photographs show the blue jeans and the two blue work shirts that Officer Hale secured as evidence. The clothing items would not be checked for blood until three days before the beginning of the trial. James Bolding, the notorious supervisor of the notorious serology department of the notorious HPD crime lab, would record that no blood was apparent on the clothing and that two blood-specific tests were negative for blood. James Bolding and Assistant DA Chuck Noll, however, would keep those test results from the jurors. Instead, under the carefully orchestrated questioning of Chuck Noll, James Bolding would inform the jurors that he had found blood on blue jeans and one of the blue works shirts. That, however, is a different frame for a different telling. Here, I will try to focus on the eyeglasses. 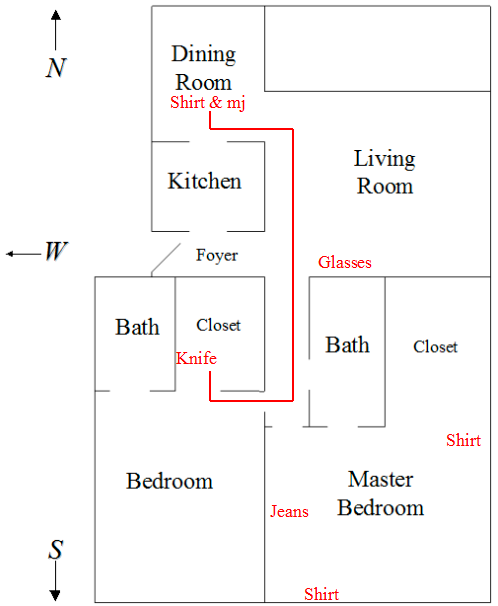 After photographing the clothing in the master bedroom, Officer Hale photographed a knife and sheath in the closet of the second bedroom. The knife and sheath had been located in the box nearby. 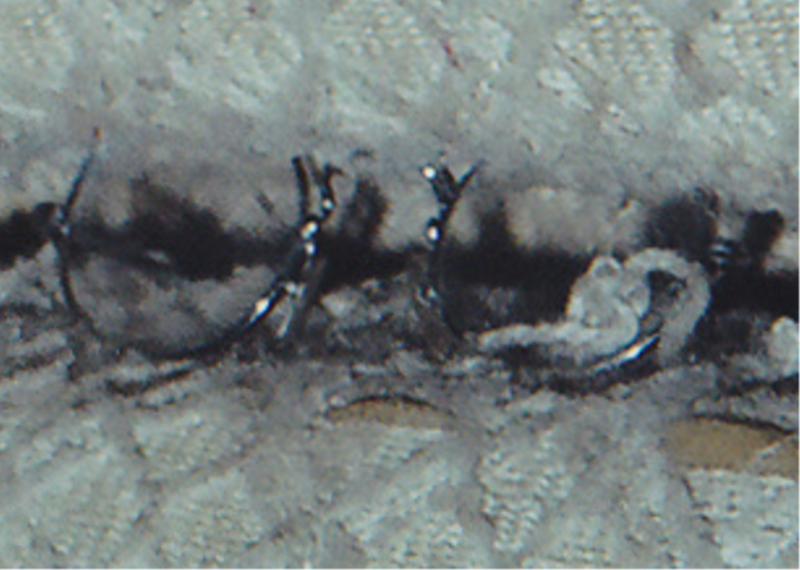 The items had been removed for the purpose of photographing them. Once again, from Officer Hale's police report, followed once again by one of my ever-enlightening sketches. Inside the closet of the southwest bedroom Officer Hale was shown a large knife wedged inside a cardboard box, found on the floor, next to the knife was a sheath. 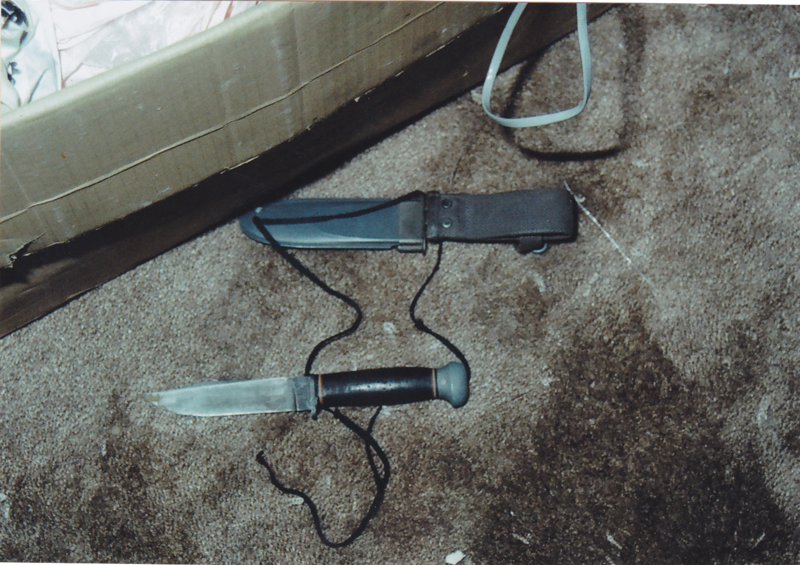 Here's the photograph of the knife and sheath. There is some rust on the tip of the knife. No blood was apparent anywhere on the knife or the sheath. The notorious James Bolding of the notorious serology department of the notorious HPD crime lab did not test this knife for blood until he was actually sitting in the witness box, testifying before the jury. He applied a reagent that reacts to the iron in rust as readily as it reacts to the iron in blood. Like magic, the reagent changed color right before the jurors' eyes. Under the carefully orchestrated questioning of Assistant DA Chuck Noll, James Bolding testified that the knife had just tested positive for blood. During the tepid cross-examination by Hughes' defense attorney, James Bolding conceded that a few other substances, such as turnips, might cause the reagent to change color. Bolding failed to mention that one of the substances that created false positives was rust. But that is a different frame for a different telling. As you can see from the photograph, the knife blade is single-edged: it has one sharp edge and one blunt edge. The blade measured five inches long and one inch wide. 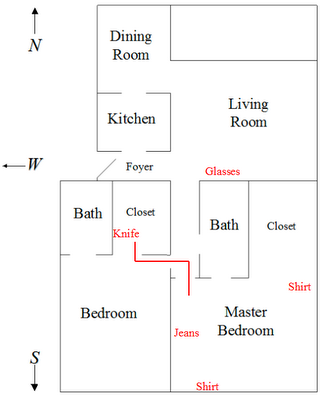 That knife, therefore, is absolutely not the murder weapon. The autopsy reports for 15-year-old Shandra Charles and her 3-year-old cousin Marcell Taylor describe lethal neck wounds that could only have been caused by a long, narrow, double-edge blade. The jurors, however, would never learn that. 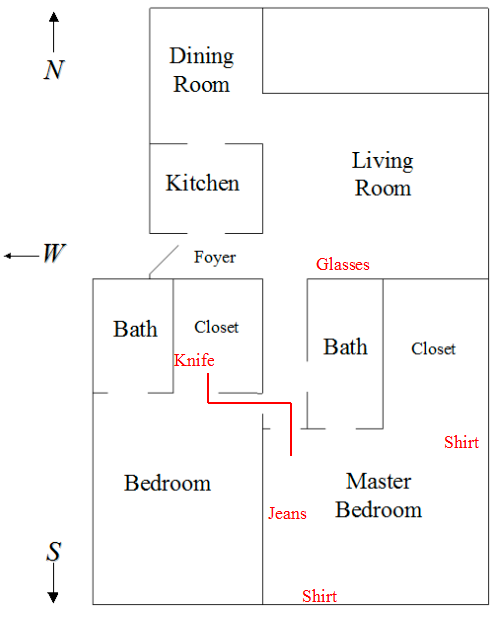 Instead, the last-moment, fill-in medical examiner, the one who had first read the autopsy reports that morning in his car, testified that the knife in the photograph above was consistent with the stab wounds. But that is a different frame for a different telling. Here, I will try to focus on the eyeglasses. Officer Hale took the maroon shirt and the green leafy substance into evidence. The green leafy substance, of course, turned out to be marijuana. No blood was apparent on the shirt. Testing was done to detect any unseen blood. CSU Officer Hale prepared a property invoice listing all the items that he had secured from Hughes' apartment, from the crime scene, from the hospital, and from the morgue. He typed the date of the property invoice in the appropriate box. That date was 9/27/88, the day after the murders. He typed his name and signed the document. He then delivered the items and the property invoice to the HPD property room. Property Officer F.L. Martin was on duty. He inserted the property invoice into his typewriter and typed his name and he typed the time he received the items from Officer Hale. The text that Martin typed is misaligned with the text that Hale typed. Officer Martin then signed the property invoice. As part of an open records request, Barbara Lunsford of the Mystery Crime Scene received a copy of that property invoice. She added two notes in red. She also outlined the date / time box in red. I obtained my copy of the document from her. I present my copy of the document immediately below. Astoundingly, the time on the property invoice is 2:58 AM. Preston Hughes' supporters long claimed that this document is proof that the police searched Preston Hughes' apartment not after sunrise, as they claimed. 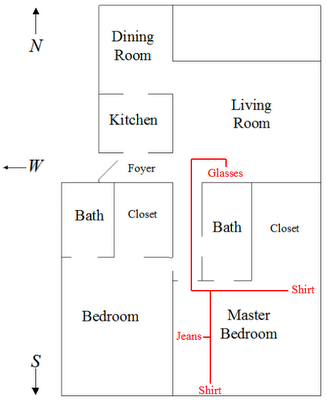 Instead, the HPD must have searched Hughes' apartment sometime prior to 2:58 AM. Since the time on the Consent to Search form was 5:35 AM, Preston's supporters claim that the search was illegal, that the incriminating evidence recovered during that search was inadmissible, and that Preston therefore deserved a new trial. For a long time, this property invoice troubled me. I agreed that it proved the HPD searched Hughes' apartment without warrant or consent. The focus of my investigation, however, was whether or not Preston Hughes' was actually innocent. I was focused on the results of the search rather than on the propriety of the search. From my perspective, I didn't see how the property invoice helped me reach a decision. 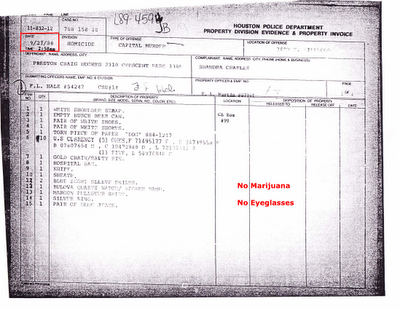 Like a bolt from the blue, it hit me that the HPD had searched the Hughes's apartment twice: once before 2:58 AM as evidenced by the property invoice, and once after sunset as evidenced by one of the photographs from the second search. I repeat that photo below. You can see sunlight through the curtain. The lamp on the dresser is off. The hallway light is off. The hallway light switch is in the off position. This photograph and the others in the collection were taken during the second search, after sunrise. Along with the property invoice, this photograph proves that the HPD planted evidence in Preston Hughes' apartment. 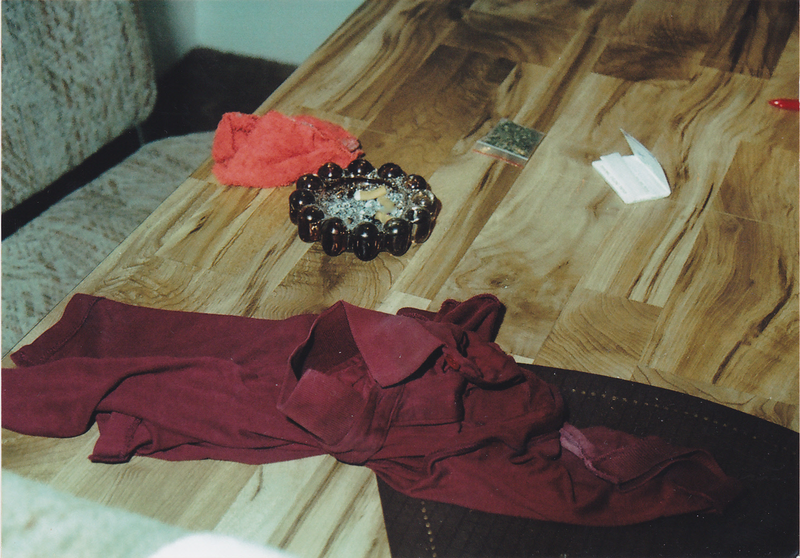 As a minimum, the HPD planted Preston's own clothing, knife, scabbard, and marijuana back in his apartment. Someone secured those same items during the first search, the search that took place not long after midnight. Officer Hale turned those same items into the property room at 2:58 AM. Someone removed those items from the property room and planted them back in Preston Hughes' apartment. It had been a serious mistake to search and secure items from the Hughes' apartment without a warrant or a signed Consent to Search. I suspect that, after the shift change, the incoming detectives recognized the problem and settled on a recovery plan. They recovered Preston Hughes' items from the property room, planted them right back in his apartment, and photographed the items as if nothing had ever happened. But it gets better, or tragically worse, depending on your point of view. 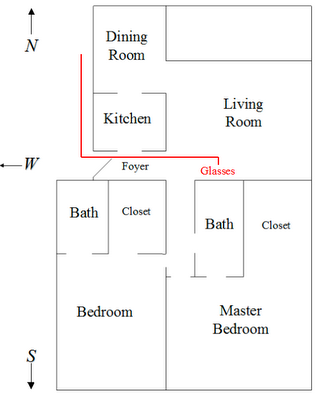 The eyeglasses that did not show up in the first search, as per the property invoice, did show up in the second search, as per the sunlight coming through the blinds. 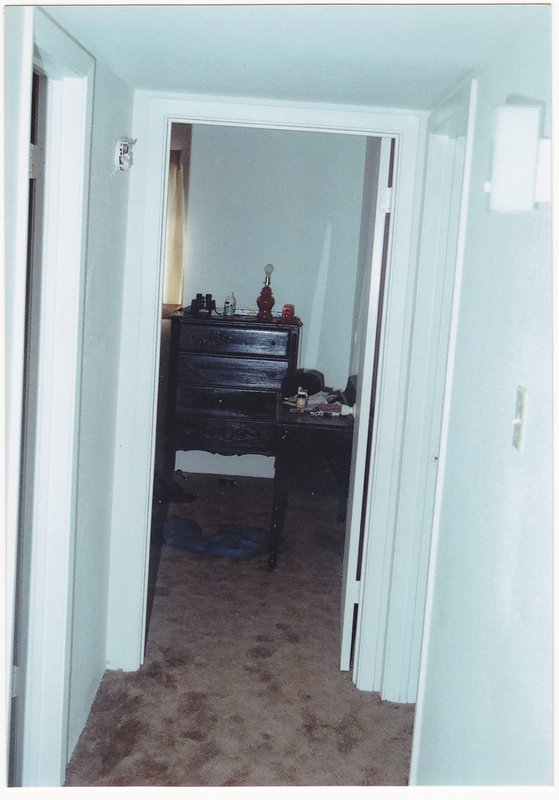 The eyeglasses were wedged between the cushions of Preston Hughes' couch not on the night of the murders. Instead they were planted between the cushions of the couch after daylight the following morning. But it gets better still, or tragically worse still, depending on your point of view. As Ward Larkin and I, lay persons that we are, were preparing multiple legal motions to save Preston Hughes from a wrongful execution, Ward Larkin discovered that there was box of evidence still at the courthouse. Among the other startling discoveries in that box were the eyeglasses. He took a picture of them. I present a cropped version of that picture below. I compared the eyeglasses in Ward's photograph with the eyeglasses in Officer Hale's photograph, the enlargement of which I repeat below. I concluded that the eyeglasses in the two photos were one in the same. Still they seemed significantly different. I wasn't struck by the writing on one lens or the label on the other. I was struck instead that the temples, the arms that extend over the ears, were so obviously visible behind the lenses. I didn't recall that from the HPD photos. I didn't recall it for good reason. In the HPD photos, the temples are extended! And there it finally is. The HPD recovered Shandra Charles' eyeglasses from the crime scene. 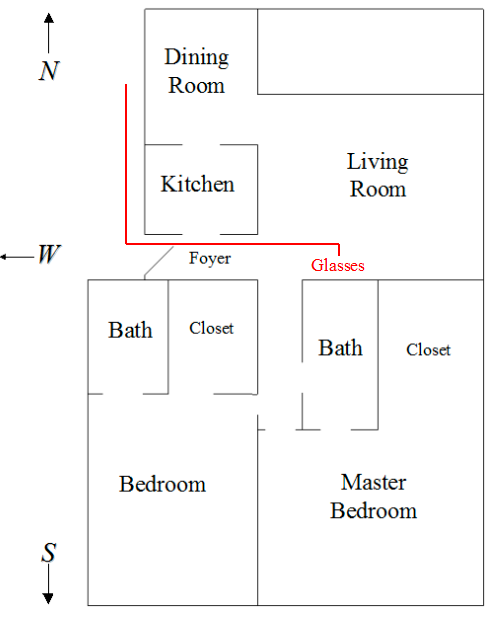 During the second search of Preston Hughes' apartment, while planting the other items back in his apartment, the HPD planted Shandra Charles' eyeglasses between the cushions of his couch. To pose the eyeglasses nicely for the impending photo shoot, the HPD extended the temples of Shandra Charles eyeglasses and shoved them between the cushions of Preston Hughes' couch until the lenses were wedged in the position shown. The State and People of Texas executed Preston Craig Hughes, III on 15 November 2012, despite clear and persistent warnings that he had been framed. This makes my blood boil!!! I love your work however, thank you for sharing it with us. I'm not done with this. I've been gone from blogging for a long time now, but I am working on the wrongful conviction problem from another angle. I'm not letting this one go. Entirely new project on this case and other wrongful conviction cases coming in a few months time.